We landed in St Lucia on the 12th of November 2009; Johnny (Foxie), our taxi driver had been waiting there for over an hour, as the flight from Toronto was delayed by that much time. As soon as we disembarked onto the tarmac it was like sticking your head in a warm oven, must have been close to 38°C with no feel of any breeze. The drive up to the marina usually takes an hour and half as it has to travel the whole length of the island from Vieux Fort to Rodney Bay, it is a very nice drive going first up the rugged east coast then across the banana plantations the rain forest and then through the capital Castries and finally Rodney Bay. The smell of the tropical forests hits you immediately while taking this ride; there is an unforgettable fragrance in the air. I had made arrangements with the boat yard to move my boat to the work area, where there is water and power outlets at more frequent spots but when we arrived the Maltese Falcon was still in the original spot that I left it 6 months earlier, the distance to the nearest electrical and water post was something like two hundred feet away. The marina crew apologized and got me all the cables and hoses I needed to connect to the boat. Brought the luggage up on the boat went to a local restaurant for supper and at 19:00 local time we were all in bed, exhausted from the long trip. With us this time came Tate our eleven year old grandson, his parents decided that this would be a great educational experience for him, we will have to home school him every day for the next three and half months he will spend with us on the Maltese Falcon. He is having a great time so far so good, even though he misses his parents, they do talk every day on the phone or on Skype when we have a connection. He loves reading and swimming and any other exiting thing an eleven year old likes. The first week on the hard in the boat yard was spent check marking things of our first list including two coats of antifouling. We launched on the 18th November 30, 2009 and motored out the one mile distance to anchor near Pigeon Island within the massive bay of Rodney Bay. Pigeon Island is a National Trust Park we pay an annual membership to be able to go ashore at the park that still has all the barrack and fortifications from when the British used it as a defense post against the French invaders. While anchored here we finished all the other chores on the second list including redesigning a new water maker mount that fits on the engine, tested and works great after many runs and modifications to the welding shop. Sails hoisted and so we are ready to leave St Lucia when we want. 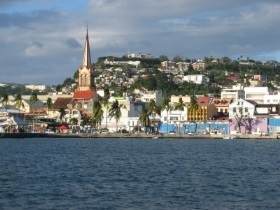 In the meantime we took trips to the very colourful open marketing Castries, daily coffee at Café Ole’ in Rodney Bay Lagoon at the IGY Marina, and some grocery shopping to fill the larder before we head over to the more expensive French island of Martinique. Tate kept himself busy swimming four hours a day in the warm tropical water at the Pigeon Island beach, either with me or Lillian to supervise him. Our third transatlantic crossing is completed. 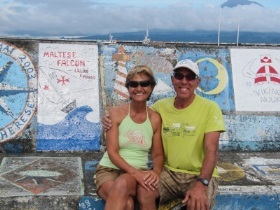 We arrived at the island of Flores in the archipelago of the Azores on the 14th of June after 21 days at sea. This was a little longer than anticipated as we had very light winds most of the way except for thirty-six hours of gale force winds in the early part of the leg just five days after departing from St Martin. We covered 2398 nm miles over the ground, about 300 nautical miles (nm) longer than as the crow flies, as we had to meander to find winds. We used the engine for a total of ninety-six hours. We had 15 days of sunshine, 5 days of rainy weather with 100% cloud cover and as mentioned earlier, 36 hours of gale force winds with gusts to forty-five knots (kts). During the gale we forereached at about 2 knots in a north-easterly direction covering only 55 nm in 24 hours. The engine run continuously for a period of 24 hours, without a bit of sail as the wind had disappeared. The other times the engine was on, we had sails up so we motor-sailed to make some decent speed and cover some good distance. All in all it was a very enjoyable passage with the light winds mostly from the north to north-east, becoming east the last few miles west of Flores. 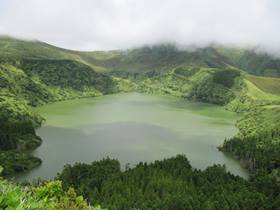 Besides Flores we visited four more island in the archipelago, Horta, San Jorge, Terceira, and San Miguel, these are all fantastic islands, very green lots of flowers many volcanoes and calderas with water in them. Very scenic to drive around, with fresh air and very clean well-kept roads. Tourism is at its infancy, but hopefully it will stay low, so it will not get spoiled by the big hotel chains that you see everywhere else. Whale and dolphin watches are the main attraction as its location is a breading and feeding ground for these cetaceans. 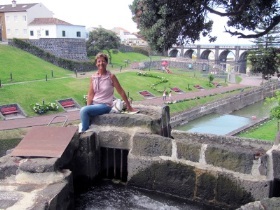 There are direct flights from mainland Portugal, NY and Toronto, to San Miguel then Sata flies interisland service to all the islands plus there is a ferry service that runs every other day to all the islands. 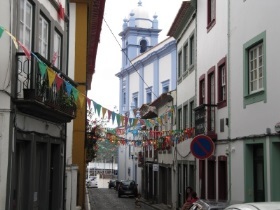 We departed for our second and final leg of our transatlantic crossing on the 8th July 2010 from Ponta Delgada on the island of San Miguel, Azores to Lagos, mainland Portugal a total distance of 830nm, we motored the first 5 days, as the wind was non-existent. The last two days we encountered the Portuguese trade winds that blew from the north at 25knots, not much to worry about as we had already anticipated this so we always stayed about 10 mile north of the rhumb line. The hardest part was crossing the northbound and southbound shipping lanes, west of Cape St Vincent, Portugal; these shipping lanes cover a distance of 20 nm west to east, it took us three and half hour to transit the lanes. We had to stay awake during the transit as we encountered 12 ships heading south but only one ship heading north. Some of these ships came very close to us but always passed us on our stern as it was obvious that they had spotted us, we called a few that looked as though they were on a collision course with us, to make sure they see us especially when it got dark and our little masthead light could very well be missed by these behemoths. They all responded and because of the weather condition and sailing direction they all changed course a few degrees to pass behind or in front of us depending on their speed in relation to our speed and course. 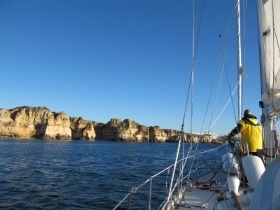 We arrived in Beautiful Lagos Portugal on the 15th July 2010, anchored outside the harbour. Every day we saw many pods of the Common dolphin, we would see them approach from the north sometimes in the hundreds leaping and driving south looking for the next meal. Some of them will break away from the pod and come and play with the boat and then just disappear to catch up with the pod that they had detached themselves from. We saw whales about a dozen times but could not identify them as some of them kept their distance from us.We spent five days in Lagos then sailed to Barbeta Spain 120 miles due SE, only stayed in Barbeta for one day as there is not much to see there. The marina is a fair walk from the town and we could not find any attractions other than a beach with some bars and restaurants that were mostly empty. From Barbeta we headed towards Tangier, Morocco but the winds got a little too strong from the west as we headed SSW so we decided to head toward Ceuta, Spain, which is a Spanish enclave located on the Mediterranean shores of Morocco, across from Gibraltar. We had a great run making 9.5kts over the ground on an easterly course, 3 kts of easterly current in the Straits of Gibraltar helped. We will be here for a while as we plan to tour Morocco and head to the Sahara and the Atlas Mountains.